Yesterday was laundry day, and every single item that Small Fry owns was in there. I washed the clothes at home, and then hubby took them to the laundromat to dry (that’s our normal protocol in the rainy season when we can’t air dry our clothes outside). But I needed to go for a walk to the store for dinner stuff. It wouldn’t do to take a baby out in only a diaper in November. July, yes. But not November. 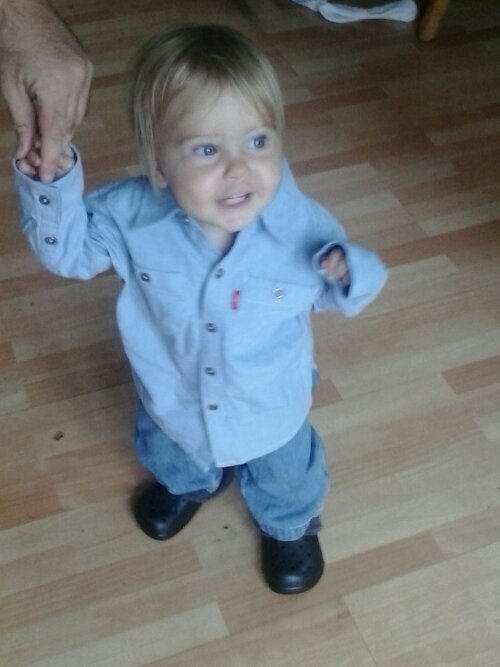 So I put one of Munchkin’s shirts on him. 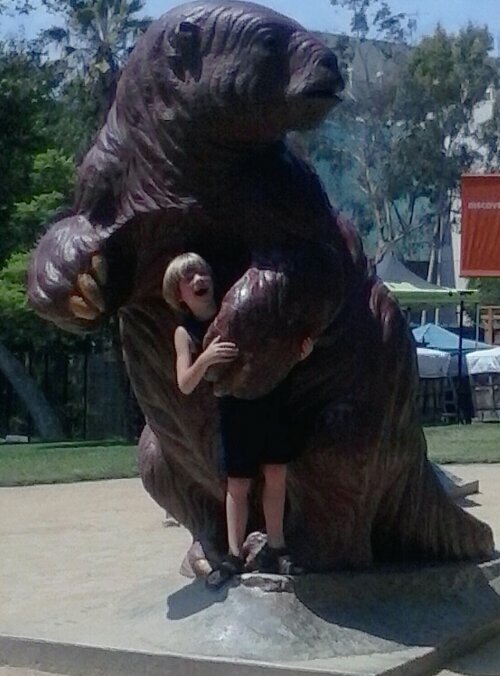 It was way too big, but sometimes you just gotta do what you gotta do. Seahawk thought Small Fry looked like Harry Potter in the too-big shirt – it looked like a wizard’s robe – so he put Munchkin’s glasses on the baby for a quick photo. 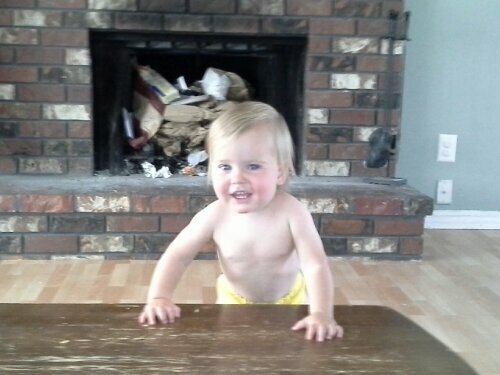 When hubby got home and saw the baby walking around, he alluded him to Yoda. Either way, funny :). 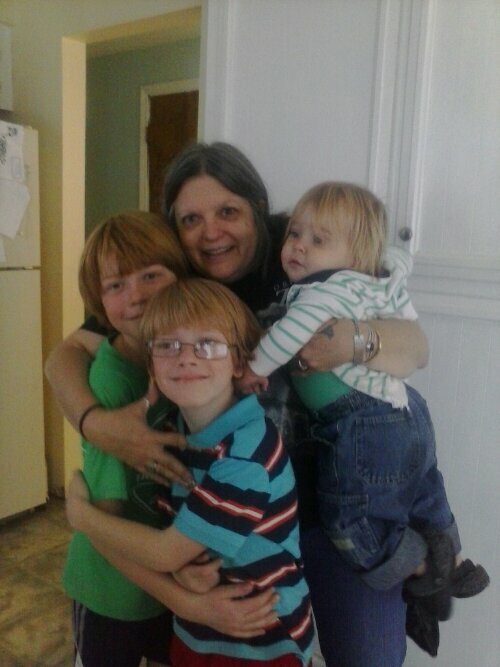 My mom was over earlier this week, so she and the kids posed together :). We had a baby shower at church last weekend. I wasn’t able to go because hubby and the kids had the car in Portland (they went to a local comic-con, much smaller than the huge San Diego one hubby went to in July), and our church is 18 miles away. But I made a gift anyway. 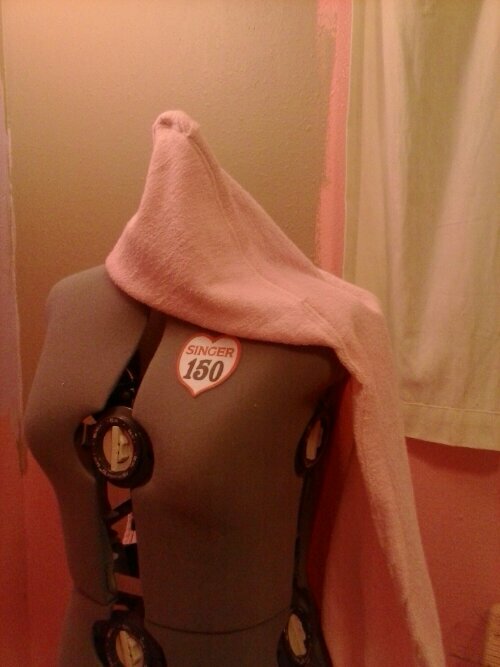 First, I made a hooded bath towel. We have one of these for each of our boys (even the older ones – they love them!) so I thought it would be a good gift. It was quite easy to make. Buy a yard of terry cloth, and cut a 13×13 inch square out of one corner. Cut off three strips that are each 1.5″ times the length of your fabric (usually 43″). From the remainder, cut a square as large as you can get – probably in the 31-inch range. Round off all four corners of the large square and two opposite corners of the small one. Fold the small square in half diagonally with the rounded corners together. Stitch the raw edges together. This triangle will become the hood. Line the raw edges of the hood up with the raw edges of one corner of the main towel piece. Sew together. Sew the reserved strips to the edge of the towel, quilt binding style. If you don’t know how to do that, click here. Vanessa from The Crafty Gemini explains it so clearly. After four years of quilting, I learned how to properly a quilt from her video tutorial – just a few months ago. 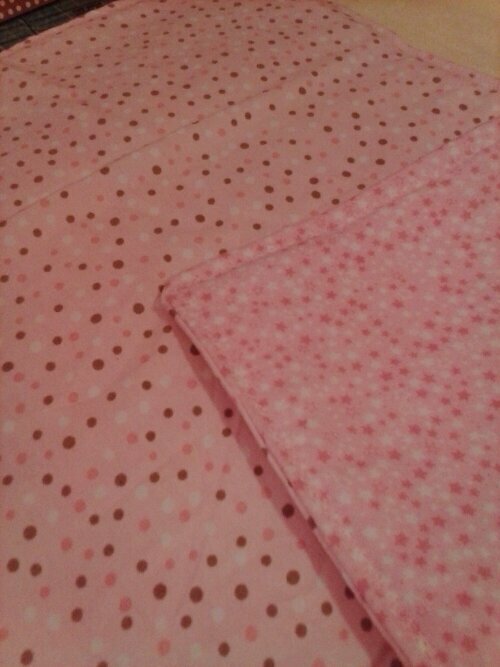 I also made this changing pad. It’s flannel on both sides (nice and soft for baby!) with quilt batting in the middle for padding. What’s your favorite baby shower gift to give? I can’t believe it’s Friday already! Where did this week go? Have a wonderful weekend :). Something You Don’t Like: Cooked mushrooms. They’re fine raw. Taking an idea from Sanz at From the Mrs, I’m doing a short “back to school” interview with each kid. Up first, Munchkin. Favorite Food: Chicken Drumsticks and Peanut Butter Sandwiches, but not at the same meal! We had one of those nights this week when the baby just wouldn’t go to sleep. As much as it pains me, we had to let (make?) 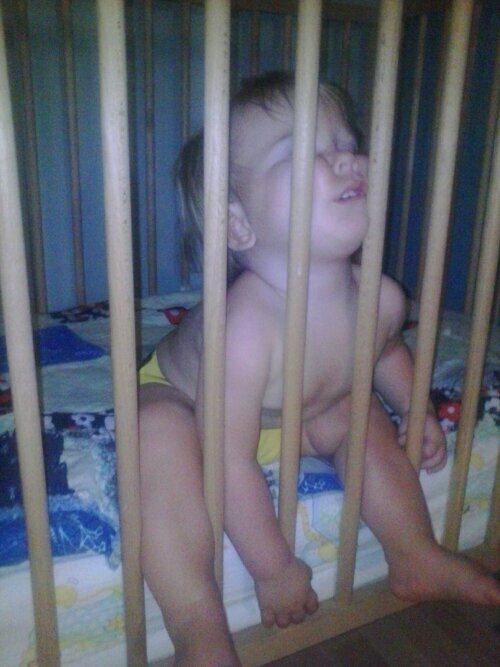 him cry it out in his crib. When he quieted down about 10 minutes after we left the room, I came to check on him and found this. I think it definitely wins the prize for Craziest Position in Which to Fall Asleep! Yesterday was Small Fry’s birthday party. It was a fairly low key affair, but I thought I’d share some pictures. 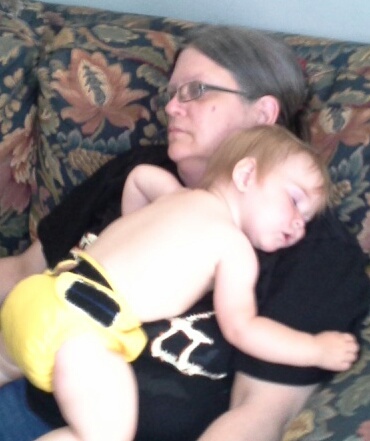 He started the party asleep on Grandma (my mom). 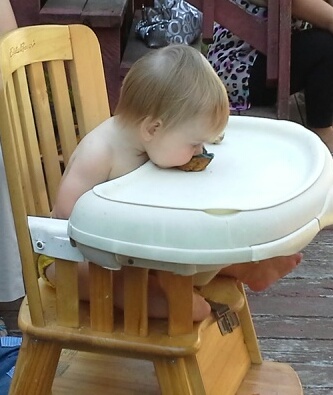 There were a few guests who thought it was weird/inappropriate that the guest of honor was asleep during the party, but at 1 you don’t argue with baby’s desire to nap. When he woke up (and after eating half a bagel), he was much happier. I made 2 cakes. This one is Hershey’s Perfectly Chocolate cake. I got one of those super huge candy bars for the top – cookies and cream. It had 16 rectangles, so I used 12 of them around the outside like a clock and grated the other 4 up and put the shavings in the middle. This one is a homemade carrot cake. I altered the original recipe a touch, though – I cut the oil back by 2/3 and subbed in some applesauce to make up the difference. 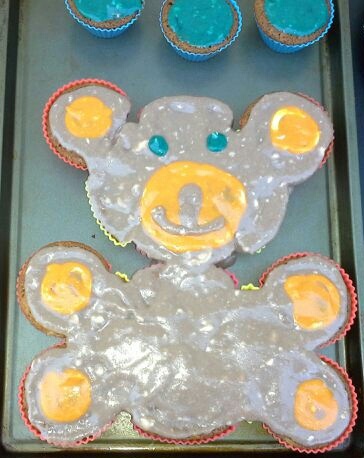 For the teddy bear shape, I used my Wilton Puzzle cakes set. Of course there’s the obligatory eating cake picture :). 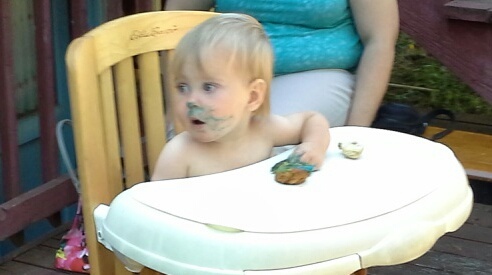 And his messy face afterward! And some playtime with Mom. Over the next 9 days, three of the five members of my family will celebrate birthdays. Mine is today, Hubby’s is Friday, and Small Fry’s is next Friday. For mine, I thought I’d share one thing for each year of my life (32!) that you may not be able to easily deduce from the blog. 1. I’m short. Extremely short. Like my driver’s license says 5’0″ but if I’m not wearing shoes, that’s not completely accurate. 2. I got married at 19. We dated in high school, but went to different schools. I think that still qualifies as high school sweethearts, right? 3. For the first 3 years of marriage, I worked as a cashier in a grocery store. 4. 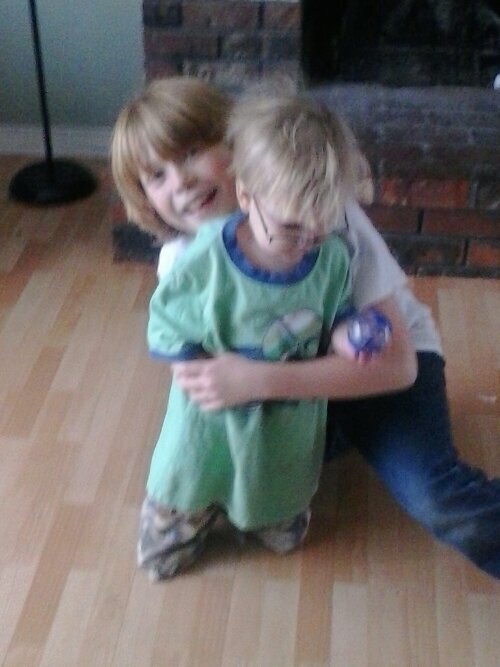 I quit that job 3 weeks before Seahawk was born in October 2003 and have playing the role of Mommy ever since. 5. Even though I know how to crochet (moderately well), I don’t have a clue how to knit. 6. I’m a member of a Nazarene church where my father-in-law is the senior pastor. 7. My mother-in-law passed away 5 1/2 years ago. 8. I’m not a very good housekeeper, but I’m much better than I was even 3 years ago. 9. I like creating things (stories, novels, quilts, things made from yarn, etc), but I don’t consider myself creative. I almost always have to get ideas from somewhere else and just execute them myself. 10. I never thought I wanted more than 2 kids, but now that I have 3, I think 4 or even 5 would be awesome! 11. I was born exactly 5 weeks before my mom’s 21st birthday. 12. I have one brother and one half brother, both younger (though much taller!) than me. 13. Both of them have 2 kids. 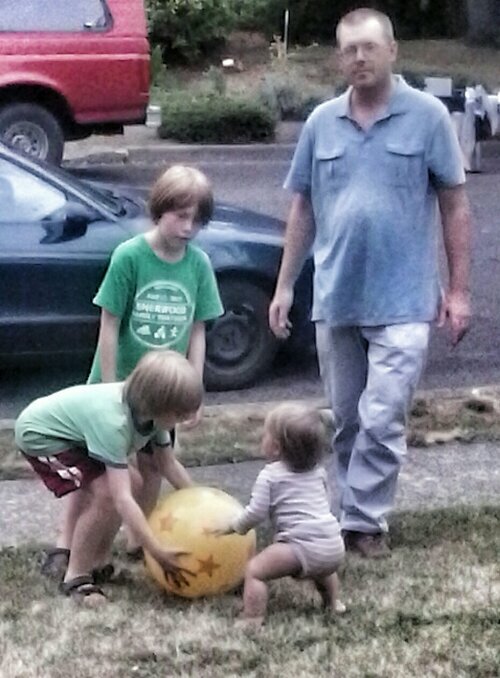 My full brother has 2 sons and my half brother has a daughter and a son. 14. My parents divorced when I was 5. My mom married my stepdad, to whom she’s still married, shortly after. 15. My mom and stepdad have no kids together. 16. On hubby’s side, we have the only boys. His sister has 2 girls and his stepbrother has 2 girls. 18. With each of our kids, we tried to pick an original name. We failed epically with Seahawk. But it’s not our fault. 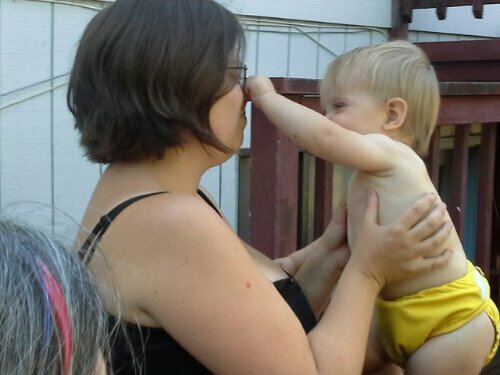 Between when we picked the name (even before I was pregnant) and when he was born, it surged in popularity. 19. With the older two, they got family names for their middle names (Seahawk was named for his father & grandfather and Munchkin for my grandfather). With Small Fry, we just picked a middle name we liked that went with his first name. 20. Hubby picked Seahawk’s and Small Fry’s names; I picked Munchkin’s. It wasn’t planned, and I love all their names. That’s just the way it ended up going down. 21. Seahawk was my only natural (though medicated) birth. Munchkin was an emergency c-section (maybe I’ll share that story when his birthday comes around in September) and Small Fry was a scheduled c-section because I’d already had one. I DO NOT recommend repeat caesarean sections. The second one was MUCH harder to recover from than the first. 22. My favorite beverage is iced tea. Unsweetened with no lemon. The plainest one available is all I’ll drink. 23. My favorite store to shop in is JoAnn. 24. I don’t hate grocery shopping. For a lot of my adult life it was the only shopping we could afford, so I learned to like it. 25. I’ve recently learned to love biking again. It’s been really fun getting back into that habit. 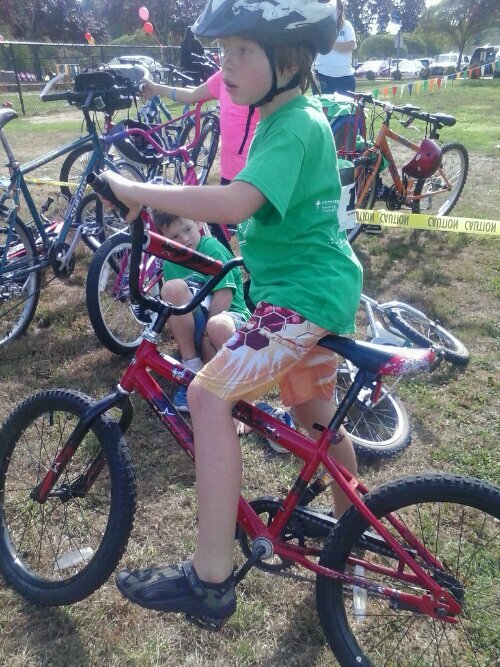 I can’t wait until we get Munchkin’s add on bike and a trailer for Small Fry so we can go for family rides. 26. I made Small Fry’s cloth diapers. But I didn’t design them (see #9). 27. 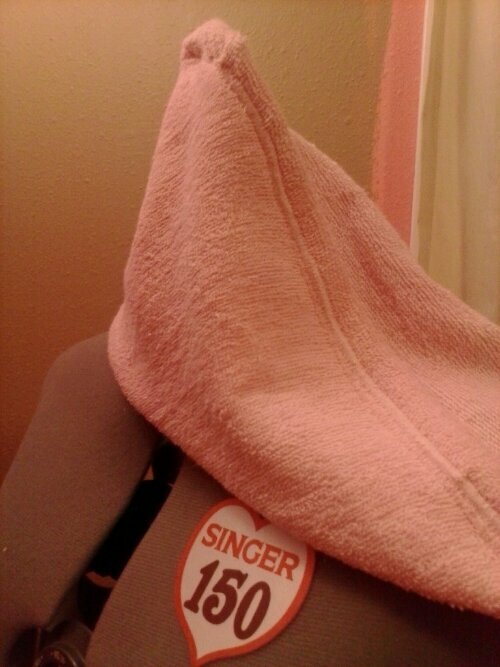 We don’t have a dryer. This is a lot less bad in the summer than in the winter. 28. One of our favorite family activities is swimming. 29. Another one is bowling. 30. I play Words with Friends. If you do, too, hit me up. My user name is wmr1601. 31. I’ve used that user name for everything online for ages (until this blog, that is). It’s my initials followed by the day I got married (Jan. 6, 2001: 1/6/01). 32. I like reading. Currently I’m reading The Girl with the Dragon Tattoo series on my Kindle. Hubby tried for a couple of years to convince me to read it, and I finally am. I hope you’ve enjoyed getting to know me a little better :).